Manila Water ranks among ASEAN’s top 50 in corporate governance | Manila Water Company, Inc.
Manila Water Corporate Secretary Atty. Solomon Hermosura receives the award on behalf of Manila Water. Manila Water was among the Top 50 ASEAN Publicly Listed Companies (PLCs) in the region named for achieving excellence in corporate governance best practices based on the rigorous assessment using the ASEAN Corporate Governance Scorecard (ACGS) in 2017. The project is initiated by the ASEAN Capital Markets Forum (ACMF) with the support of the Asian Development Bank (ADB) to establish a common governance framework across the region and to raise the profile of ASEAN PLCs within the global investment community. 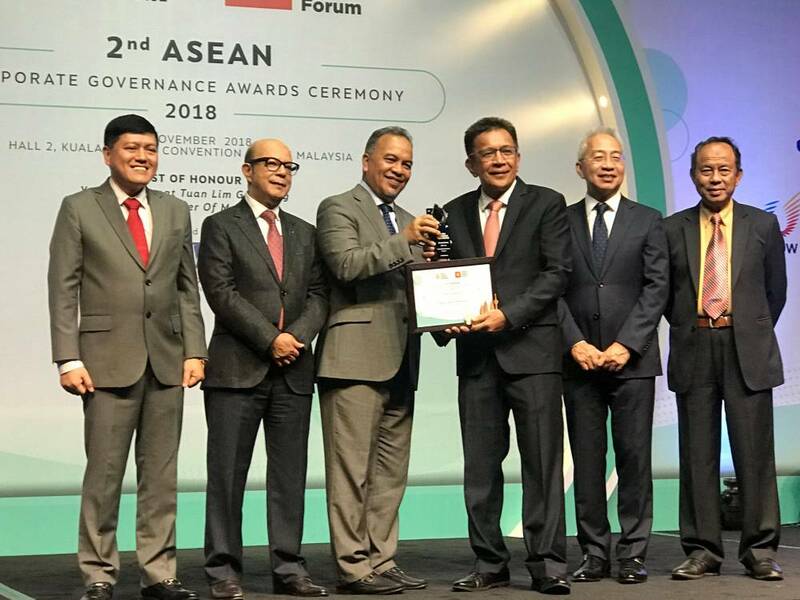 The awards ceremony, held on November 21 at the Kuala Lumpur Convention Centre, was led by Malaysia Deputy Minister of Finance Yang Berhormat Dato’ Ir. Haji Amiruddin Hamzah. The event brought together about 800 representatives from ASEAN regulators and stock exchanges, regional corporate governance experts, ADB, Malaysian PLCs, institutional investors, and media, as well as chief executives and chief compliance officers of winning companies. Three other companies from the Ayala Group were also included in the roster including Ayala Corporation, Ayala Land, and Globe Telecom. Other Filipino companies that ranked in the Top 50 are SM Investments Corporation, SM Prime Holdings, China Bank, Aboitiz Equity Ventures, and Aboitiz Power. The winning PLCs were determined based on their performance in the recent ASEAN Corporate Governance Scorecard (ACGS) assessment, which benchmarks against international best practices. This is the second consecutive win for all four aforementioned Ayala companies. Manila Water, Ayala, Ayala Land, and Globe also won in the inaugural ASEAN Corporate Governance Awards held in 2015 in Manila.